An early runner on Wii U eShop? As you'd expect in a press conference limited to little over an hour, not all upcoming titles were shown off in the main event. One of these was Trine 2: Director's Cut, which sounds like an extended edition of the PlayStation Network and Xbox Live Arcade version of the title. It wasn't clear from the very brief appearance in an updated video whether this will follow the lead of the other consoles and appear exclusively as a download or not, but we'd assume this will be part of the Wii U's eShop — or equivalent — platform. It's a stylish and visually appealing 2D action sidescroller: so who's in? Good point (about it being DL only on the other 2 systems). PS+ got this free last month, myself included. It is a beautiful looking game and it looked even better on WiiU. They also didn't talk about Project P100 which looks a bit like the future PSN title When Vikings Attack. Only P100 looked a lot better. They should have showed it instead of NintendoLand. I'm in, if the original got good reviews? Played the demo on 360 and it's pretty good. I'll end up buying it eventually. Not as good as the original if you ask me, it sure looks great, but you basically just do the exact same one or two things over and over to solve every puzzle. And you can just completely cheese your way through it in multiplayer. awesome! this game is great! I could see this working on the Wii U. If you guys are curious about a review, I just recently reviewed Trine 2 with a 9/10 score for PS3 over at our sister site Push Square. You can read it here. 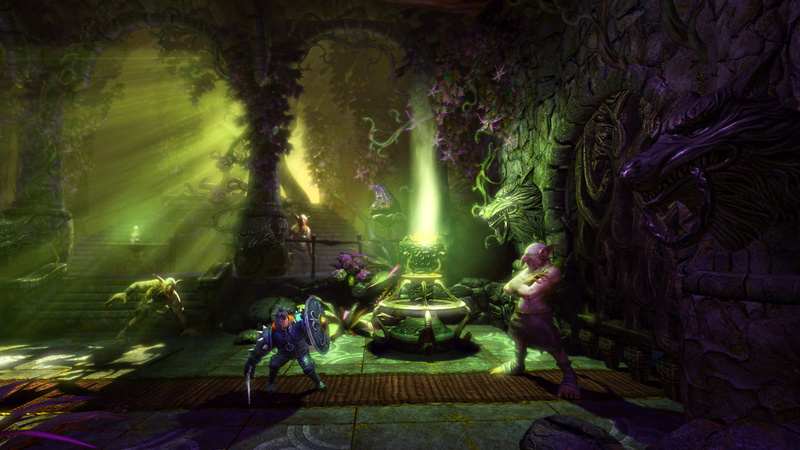 Trine 2 is awesome! Very worth while title! Looked like one of the very best titles of the conference. Online multiplayer can't hurt either. Not so sure about a purchase anymore though since various people say the puzzles are quite drab. LOVED the original, I played trough it twice. Definitely getting this Day one. Looks awesome! Very cool that it's also coming to Wii u! I would also love the first 1!